We are working with respiratory protection in tanks, silos or heating plants and biogas plants. If gas, dust or not respirable air are present, we are able to perform the appropriate work using our equipment. 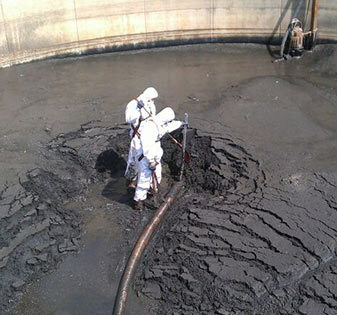 Our team has a professional education and is therefor able to perform maintenance jobs, repairs or installations with the appropriate protective clothing under the difficult circumstances of tanks without respirable air. Also the asbestos abatement belongs to our service package. We take professional care of asbestos abatement in the framework of demolition and restoration work, especially of buildings built from 1950 to 1970, and as well offer our clients the disposal of special waste. If you are interested in our services, get in contact with us. We are pleased to provide you advise personally and create an offer at no charge for working with respiratory protection europewide.